In 2007, we commissioned them to develop and extend the project. They brought together a group of regional and national artists with a wide variety of skills (dance, video making, performance, music and sound) for the dance-film project, Morecambe Dances. Again encouraging public engagement with dance on Morecambe promenade, this ambitious piece focused in on different features along the prom where local dance groups and passers-by are seen breaking out into routines and improvisations including a pushchair conga, a tap dancing duet and synchronized swimmers on dry land. 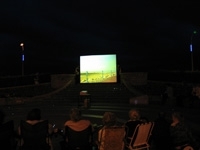 The film was premiered on a giant outdoor screen on the prom itself, with food, dancing and a party. This event drew in a substantial crowd, including much walk-up from interested passers by.